To experience the distilled emotions poetry is enough. But when art is also included the feel enhances multiple times. HYDERABAD: To experience the distilled emotions poetry is enough. But when art is also included the feel enhances multiple times. That’s how at Gallery Space, Banjara Hills the Saturday evening came alive when two books were launched by Delhi and Calcutta based poets while the paintings of Ramesh Gorjala, adorning the walls of the venue, added a mystical layer to the literary evening. 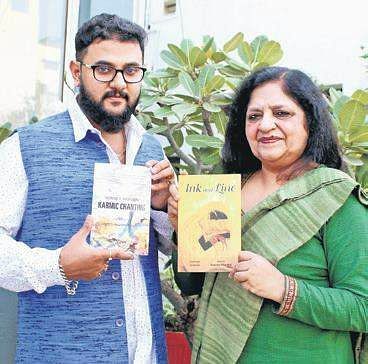 Delhi-based poet Sukrita Paul Kumar and Calcutta based poet Sonnet Mondal came all the way to Hyderabad to launch their collaborative collection ‘Ink and Line’ published by Dhauli Books, 2018. The book has interesting paintings and sketches by artist-poet Sukrita while Sonnet has penned the verses. The book traces trajectories of nostalgia as the wordsmiths express themselves through stanzas and colours. Both of them coordinated with each other via emails to complete the collection. They also narrated tales related to the poems and paintings. Sukrita, author of several poetry collections and fellow at different universities, revisited her growing years stating how they affected her art. The second part of the literary event saw the launch of Sonnet’s latest poetry book ‘Karmic Chanting’ published by Copper Coin Publishing, 2018. He read some of his works from the book which were rich in metaphors and similes. The poems explored mysticism in daily objects of life whether it was seeing plastic sunflowers in his room or sitting in his friend’s balcony facing the sea in Mumbai. The poet, an author of five poetry collections, is widely published across Europe, North America, Australia and Asia. Poet Nabina Das and another city-based poet were in conversation with them.